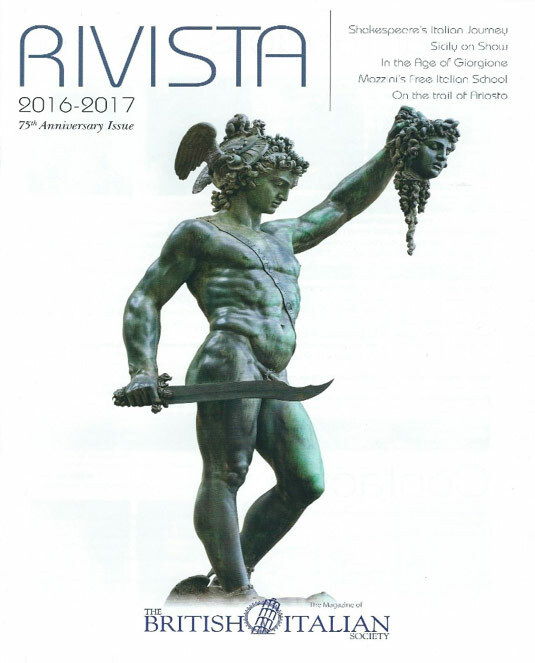 The latest issue of Rivista was distributed to members in November 2016. In it we mark a number of significant anniversaries. The Society celebrated its 75th Anniversary in 2016, while the British Institute of Florence prepared to celebrate its Centenary in 2017. The issue also covers the anniversaries of Ariosto’s epic poem Orlando Furioso (1516) and Shakespeare’s death (1616). We consider the tantalising question of whether Shakespeare ever visited Italy. Sicily features prominently in this issue, following two high-profile exhibitions at the British Museum and at the Ashmolean during 2016. There is also full coverage of the Society’s lectures and activities during 2015-16. We are grateful to all those who contributed articles, pictures, reviews and advertisements for this year’s magazine. We welcome any offers of relevant material for future issues of Rivista. Please get in touch.